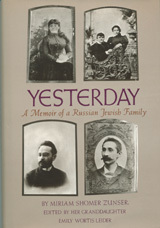 YESTERDAY is the compelling chronicle of three generations in the life of a Russian Jewish family Ð from the time of Czar Nicholas I through the first quarter of the twentieth century, from small Jewish enclaves of Russia and Poland to the shores of America. Written with the directness, vitality and charm of a folktale, the book was originally published in 1939 on the eve of the outbreak of World War II and describes a world which has largely vanished. We share the joys of wedding celebrations, songs and Sabbath rituals, as well as the dark side - pogroms and military conscription. Emily Wortis Leider has added a postcript on the life of her grandmother, the author, playwright, sculptor, art teacher and columnist Miriam Shomer Zunser. Out of print, this book can be ordered on second-hand book websites including MX BookFinder and Amazon.com. Emily Leider wrote a series of poems based on this memoir, which were published in her RAPID EYE MOVEMENT & OTHER POEMS. The poems were set to music by composer Ivan Rosenblum, as a song cycle titled "Shtetl Voices" that has been recorded by the Wolford/Rosenblum Duo and mezzo-soprano Stephanie Friedman on the Centaur label. The CD that includes the song cycle is called "Laughter and Tears."